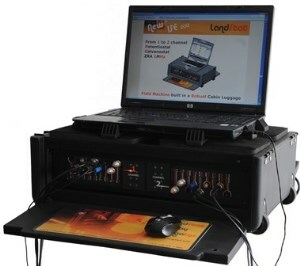 As with the OrigaStat range, the LandStat range can be used as a Bipotentiostat. To do so, it is necessary to consider the LandStat two channels. On one channel, truly a potentiostat, you connect a working electrode. On the other one, you connect the second working electrode, the counter-electrode, the reference electrode (if you work with three electrodes) and a second reference electrode (if you work with 4 electrodes). The electrodes are connected as below, according to the electrode configuration you need. In 2 electrodes: Two working electrodes and one counter-electrode. In 3 electrodes: Two working electrodes, one counter-electrode and one reference electrode (see the draw below). In 4 electrodes : Two working electrodes, one counter-electrode and two reference electrodes. Many options are available. Concretly, you can use one or two different computers. You need to open twice OrigaMaster. On one comuter, you can open two or more OrigaMaster sessions. The session 1 will monitor the Potentiostat n°1 and the session 2 will monitor the Potentiostat n°2. The Potentiostat n°1 is connected to the PC via an USB cable. Into the OrigaMaster 5 PC software, "START" block has to be set on "2 electrodes". The Potentiostat n°2 is also connected to a PC (the same computer) with a USB cable.